Abermaw (Barmouth in English) is a small town of around 2,500 permanent residents, situated on the Estuary of the Mawddach River in North Wales. Usually a fairly quiet and peaceful area, it springs to life around the summer holiday period, when the population can swell up to 25,000 people, staying in a host of accommodation, from hotels and guest houses to caravan parks and camping sites. It has lots to offers visitors (and its locals) and is famous for its beautiful bridge and pretty white beaches. Barmouth beach, in the summer months, is an extremely busy place, with families taking time away from large English cities (mainly Birmingham and Liverpool) to head to the coast for some fresh air and famous fish and chips! The town started life being built around a busy shipbuilding industry, but is now primarily a destination for day-trippers, holidaymakers, walkers, cyclists and climbers, as well as boat enthusiasts who can sail into the beautiful harbour area. 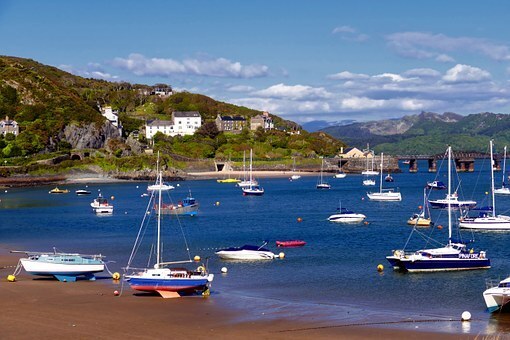 Barmouth is very famous for being the starting point of the annual Three Peaks Yacht Race, where teams of sailors and mountaineers set sail from the coast in order to see who will be the first to sail from Barmouth to Fort William. To keep it interesting, they're also required to climb the three highest peaks in the UK while they're at it. These are; Snowdon, which lies in the same region as Barmouth; Scaffel Pike in England's a Lake District, and the Daddy of them all: Ben Nevis n the Scottish Highlands. If you're in town to see the start of the race, it's a fantastic experience and always great to see the different nationalities taking part. They're usually a few Welsh teams, so that's enough to keep the locals more than interested. In addition to the Three Peaks, Barmouth also hosts many other celebrations and festivals throughout the year, including their popular Country Music festival each July. When there are no special events on, there's still a ton to do and see locally, with beautiful independent boutique stores offering clothing, jewellery and antiques, amongst others, and a wide range of older style and very modern bats and restaurants, including the award-winning Bistro Bermo. Down by the beach is the harbour, replete with ice cream parlour, traditional bars, Davy Jones Locker, and the wonderful Lobster Pot, where your dinner is caught a few metres away from your plate. In the middle of town, lies a large arcade and amusements area which keeps children of all ages contented, while tolerating their parents of every last penny of spare change. If you happen in town for the sunset, a great spot to take this in is the Min y Mor Hotel patio, which directly faces the beach. Barmouth is well served by trains, which arrive and depart from the station located in the centre of town. The town is also very compact and walking from one end to the other takes no more than around 15 minutes or so (depending on your fitness levels, obviously). The town also has a large supermarket and smaller Spar stores to cater for all your needs.